BEIJING - China's non-financial outbound direct investment (ODI) in July dropped by 58.1 percent year-on-year to $3.73 billion, mainly due to a decline in the amounts going into developed economies such as the United States, the European Union and Japan. But foreign investment experts and a Ministry of Commerce official said that the decline was only temporary and long-term prospects for China's ODI were bright. According to the ministry, the drop in July was the first year-on-year decline this year. 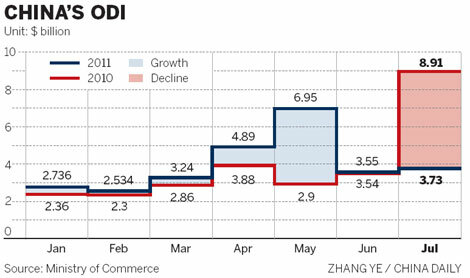 "It (the monthly drop in ODI) is only an individual case, caused by a range of factors, including a decline in investments into some developed nations," ministry spokesman Shen Danyang told the monthly news briefing on Wednesday. Shen declined to elaborate but said he was confident that "growth for the nation's ODI could rebound to a high level in the fourth quarter, as some big deals are under way". Statistics show that, from January to July, ODI in the non-financial sector edged up a mere 3.3 percent to $27.6 billion, as investment into the EU, US, Japan, Russia and the Association of Southeast Asian Nations shrank. No specific country figures were released. But non-financial ODI into Australia expanded 102.5 percent, while that into Hong Kong was up 23.9 percent. "The slowdown in the growth for China's ODI in the past few months can be mainly attributed to the debt crises sweeping the US, EU and Japan, which have dampened local investors' confidence and also led to a new round of investment barriers worldwide," said Zhang Monan, an economist with the State Information Center, who studies the global economy. Rising costs for mergers and acquisitions and investors' growing awareness of risk control were other major reasons, she added. Standard & Poor's downgraded the US long-term sovereign debt rating early this month, and on Wednesday, Moody's Investors Service cut its rating on Japan's government debt. But experts are upbeat about China's ODI in the long run. 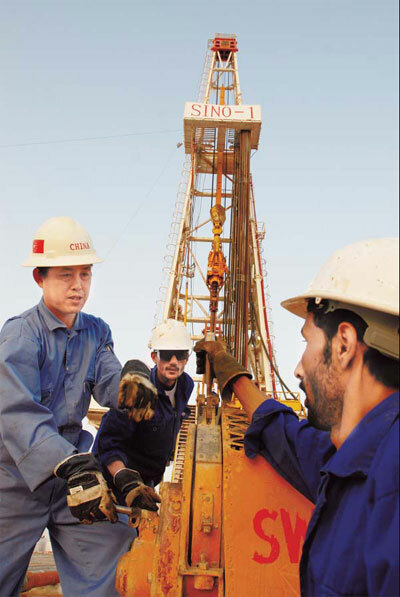 "It's not only about large scale, and ODI will be diversified and its quality will improve a lot," said Zhang. "Of course, we cannot exclude the possibility of a slowdown of growth in the short term." Lu Jinyong, a professor at the University of International Business and Economics, agreed. "The big picture is rosy, and it's an unchangeable trend," he said. Minister of Commerce Chen Deming said on Tuesday at a forum that this is a favorable time for Chinese companies to invest overseas, and the scale of their investment will rise rapidly. The Ministry of Commerce and the State-owned Assets Supervision and Administration Commission have agreed to promote and standardize the procedures for State-owned companies' investment overseas in the next five years. The two agencies plan to help State-owned companies draft a long-term strategy and establish risk controls. During the first seven months, inbound foreign direct investment grew by 23.7 percent year-on-year to $59.5 billion, although investment from US-based companies fell 19.2 percent. Healthcare giant Abbott Laboratories Inc said earlier this month that it would invest $230 million to establish a nutritional products factory in Jiaxing, Zhejiang province, the company's largest investment in China. Lu Dong contributed to this story.